The rigid rules of mourning dress were made to protect the privacy of the family, primarily the women, during their time of grief. As the man of the house could not afford to retire from society and his business concerns, a simple black crape armband on sleeve or hat was a satisfactory outward sign of a death in the family. The required year and one day for a widow’s “weeds” of dull black crape began as a fashion in the aristocracy which trickled down over the nineteenth century to the poorest levels of society. Those who could not afford mourning would dye dresses black and go into debt to give the deceased a proper funeral. The funeral supply industry reached its zenith in the mid-nineteenth century. With the death of Prince Albert and Queen Victoria’s heavy grief, the code of ritual became even more pronounced and would continue to be observed in most part until WWI. A widow could, after a year and a day, go into “half mourning” and wear a touch of white or gray, some jewelry and black fabric with a sheen. Jet, vulcanite, bog oak, gutta percha, onyx, and other black stones were considered appropriate, sometimes relieved by small seed pearls, which symbolized fallen tears. The town of Whitby, North Yorkshire was the center of the true jet industry and still produces the lightweight inky black petrified wood jewelry. Eventually, the widow might progress to lavender, and finally into colors after two years. 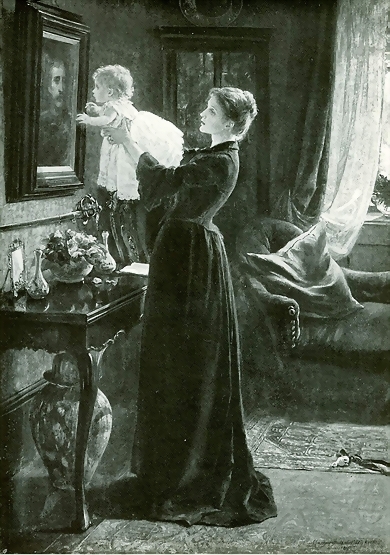 Young children were often put into white, or white trimmed out in black or gray with even their dolls put into mourning. Many thanks for the excellent information. It has helped me a lot to understand why I should wear black at my Mother’s funeral later today. Could you please tell me some details about a few of the images in your mourning slide show… ? What artist did “Remembering Father”? And where did you find the photograph of Queen Victoria in mourning attire at her daughter’s wedding? It’s spelled crepe, not crape. Very interesting stuff! I love that first picture of the baby with the mother in her mourning dress. hello i’m researching about this topic and i really want to know more about mourning etiquette. Why does women(widows) have to wear mourning in black ( in case of cover her full body in black and last long for 2 years)? Is that just to pray respect to the death and grieving / or keep protect oneself form dead spirit like fear. thank you for your comments it’d be useful for me very much to keep on my project.